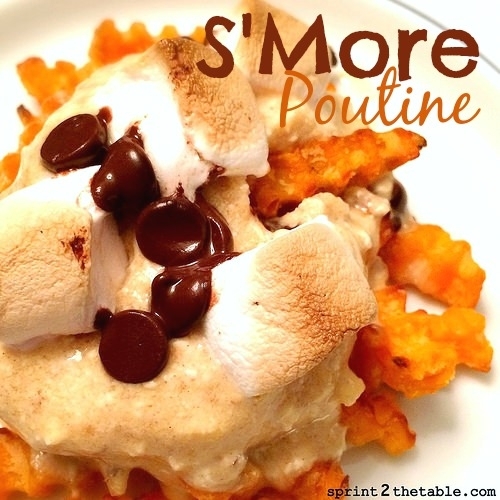 Many of you have heard of poutine. It basically french fries with gravy. Wellâ€¦ Iâ€™ve always found it to be a bit overwhelming. I donâ€™t love white potatoes or gravy. I do love sweet potatoes and anything involving peanut butter sauce. This sounds strangeâ€¦ but I hand-on-the-Bible swear itâ€™s good. Bake the sweet potato fries according to package instructions on a piece of foil or parchment. Meanwhile, mix together Gravy ingredients in a small bowl. Remove from oven and top with gravy, marshmallows, and chocolate chips. Return to oven under broil for 1-2 mins. Watch it closely â€“ it will burn! Allow to cool slightly before transferring to a plate. *Note: I buy my peanut flour on iHerb. You can use discount code USO924 for $5019 off your order. You could also use protein powder or nut butter here. If you use regular nut butter you may want to reduce the amount of milk.